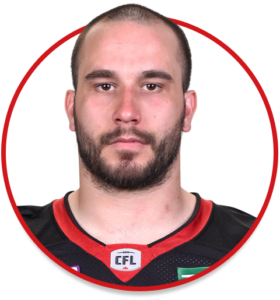 Jason Lauzon-Séguin is an offensive lineman currently playing with the Ottawa REDBLACKS. Selected in the first round (seventh overall) in the CFL Draft on May 10, 2016. Signed to his first CFL contract on May. 24, 2016. Played in all 18 regular season games and playoff game for the REDBLACKS. Nominated for the CFL’s Most Outstanding Rookie after a solid first CFL campaign that saw him play nearly every position on the offensive line … Voted CIS All-Canadian at guard in 2015 … Selected RSEQ conference all-star at guard in both of his seasons with Laval, where he majored in social studies … Came of age as a football player as a member of the Collège de Valleyfield Noir et Or … Grew up in St-Eugene, ON, near Hawkesbury.